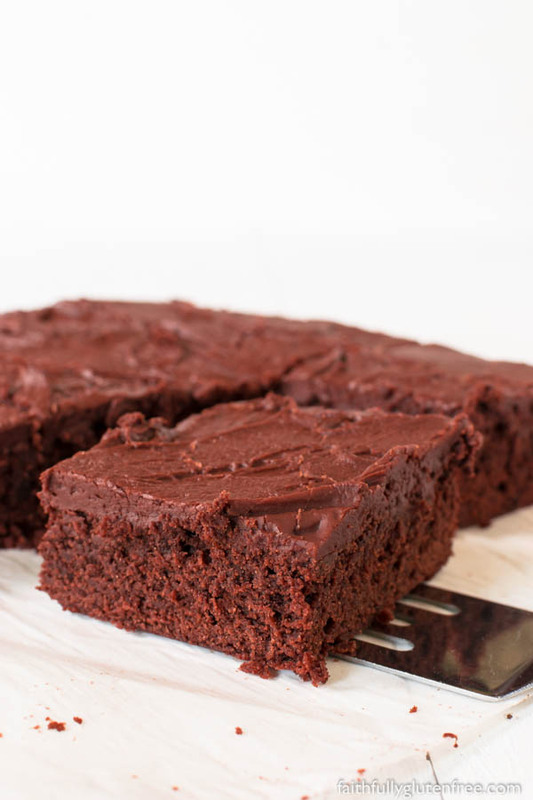 Gluten Free Lunch Lady Brownies are the perfect combination of cakey and fudgy brownies, and the frosting is out of this world. Being the Lunch Lady can’t have been a bad gig when you were serving up these treats. 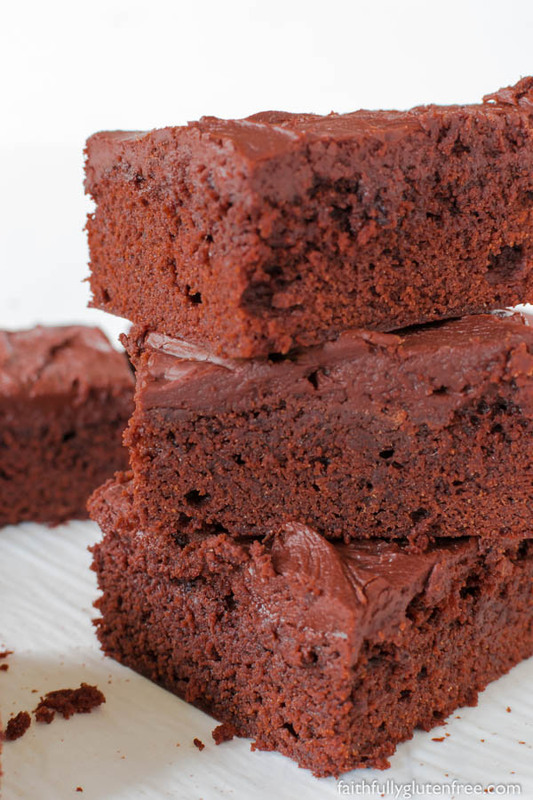 Brownies are a dessert that everyone in my house loves. The thing is, there are so many different kinds of brownies. 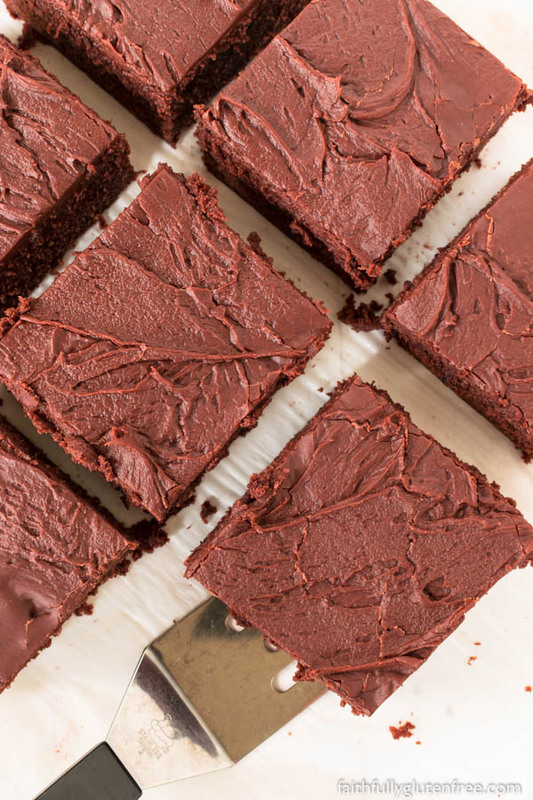 Some like Sheet Pan Brownies, or Farmer Brownies, because they are like a thin, moist chocolate cake topped with frosting. These gluten free Lunch Lady Brownies are a perfect marriage of the two kinds of brownies, if you ask me. 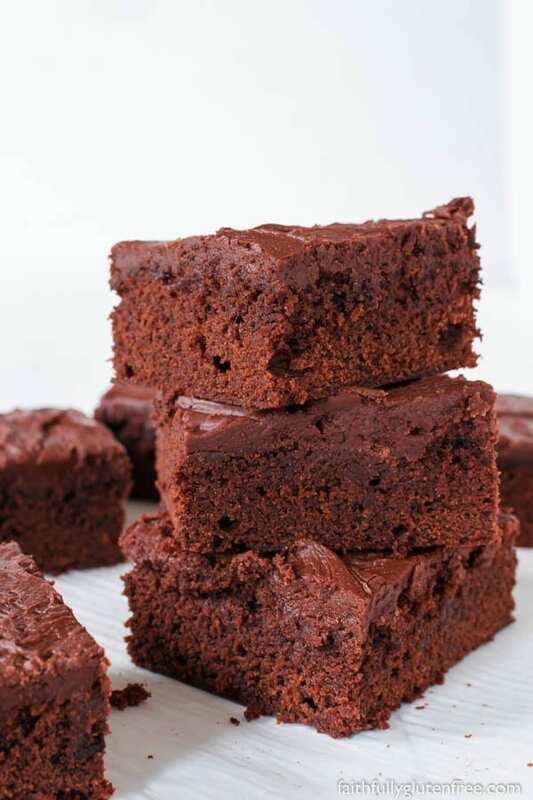 They are a moist, rich brownie, with a nice tight crumb. And that layer of chocolate frosting on top – well, that’s really the icing on the cake. You prepare the frosting while the brownies are baking and spread it on while they are still warm, and it forms a nice crust on top once it has cooled. It is just perfection. Be sure to check your brownies for done-ness while they are baking by inserting a toothpick in the middle. If no crumbs stick to the toothpick, the brownies are done. And if crumbs are sticking to the toothpick, give it another 2 minutes and test again. Over-baked brownies will still be delicious, but they will be drier than perfectly baked brownies. Gluten Free Lunch Lady Brownies are the perfect combination of cakey and fudgy brownies, and the frosting is out of this world. Being the Lunch Lady can't have been a bad gig when you were serving up these treats. Preheat the oven to 350 degrees F. Grease a 9x13-inch baking pan and set aside. In a large mixing bowl, combine the butter and cocoa powder. You can use a spoon, but an electric mixer makes it easier. In a separate bowl, whisk together the sugar, rice flour, sorghum flour, tapioca starch, and xanthan gum. Stir the sugar/flour mixture into the butter/cocoa mixture. Add eggs and vanilla, and mix just until combined. Scrape the batter into the prepared pan, spreading it to make an even layer. Bake in preheated oven for 20-25 minutes, testing for done-ness at 20 minutes. Remove from oven, and allow it sit for 10 minutes before frosting. Beat all ingredients together until smooth. Spread evenly on the still-warm cake. Let cool before you slice and enjoy.